I wouldn’t be a good Bitcoin wife or mother if I didn’t seize the opportunity to teach the Bitcoinettes a lesson in responsibility to oneself and the household. I have made it a point in the past to separate chores and allowance, making the existence of both mutually exclusive. I am putting that philosophy aside and doing a trial run of Bitcoin micro-rewards I created as a custom reward within the online chore chart My Job Chart. I’ve been wholly against the kiddos earning money from chores partially due to my oldest son, who is a miser in his own right. He, who managed not only to save every birthday money gift by the age of 6 in order to buy himself a Nintendo DS, but had also invested $50 into the Bitcoin market last year when it was around $5. He has not spent a single satoshi. While the other kids emptied their pockets for trinkets and toys, he was tracking his earnings and saving for the big ticket items, like his first electric guitar at 12. It’s a harsh reality to face when your kids are cooler than you…sigh. Sooo, anyhow – to avoid the inevitable “how much will you pay me to do the dishes?” scenarios from him, my system has been dolling out a monthly allowance equal to the age of each child ($7 for my seven year-old, $10 for my ten year-old, etc.) with the understanding that the funds are for them to manage and to use for their wants that are outside the scope of “basic needs”. Of course, my 10 year old still insists that video games are a necessity in his life. The allowance is not contingent on completing household chores, but is a privilege that can be taken away for bad behavior. Responsibilities of the home are viewed as a shared workload for the entire family, and everyone has a role in its maintenance. This has worked for the most part, except that chore charts are just B.S. They are the bane of my existence and never work for more than a few days. If you are shaking your head, saying they work just great for your family, you are either June Cleaver or in some serious denial. I’ve done the wheel, magnet board, calendar, you name it. For a while I tried a spreadsheet, because I am rather obsessed with Excel-ing my life away, but what kid wants to stare at a cell grid? Then last year, I caught wind of My Job Chart. My Job Chart is an online chore chart and reward management system for the entire family. It is a free service, and has mobile apps for the iPhone and iPad. Each child is given their own login under their parents account, where you assign custom daily and nightly tasks. 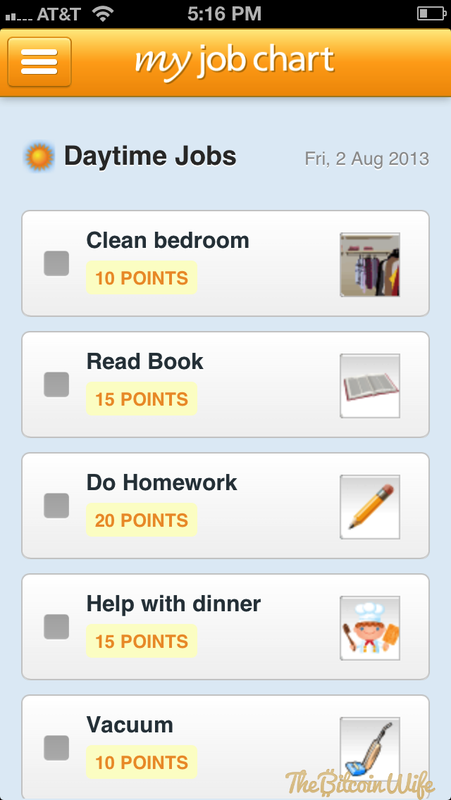 These tasks have a point system attached to it, and as your child marks off their assignments, they accumulate points. 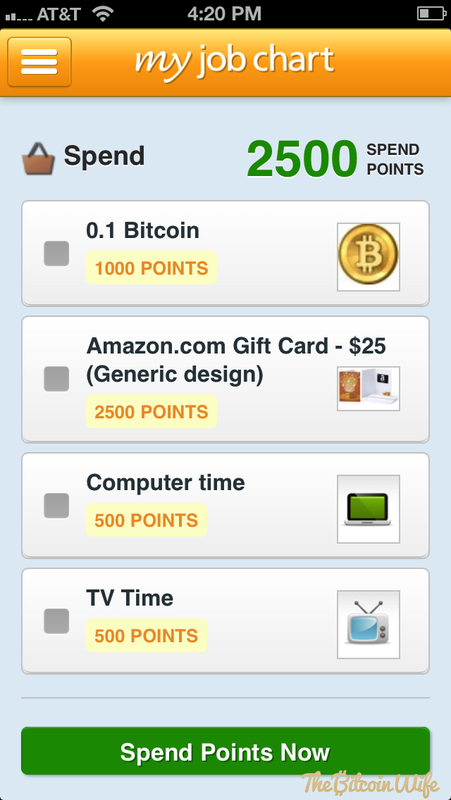 These points are then divided out between savings, sharing, and rewards. Of course, the fun part for the kids is redeeming the rewards. They have some stock rewards, such as TV time, ice cream, and Dad time as well as retail awards that are managed through Amazon. The custom rewards is where the rubber meets the road, and a Bitcoin reward seems like a natural progression in the grand scheme of teaching the kids how to save, how to shop, etc. Once the Bitcoinettes have earned enough for the 0.1 BTC reward (I’m planning to flex the amount based on the market value…for now), they hit redeem and I am notified immediately via email. I would then send them the Bitcoin to their wallet. It’s all a very manual process, and it would be awesome if there were a service like this integrated with Bitcoin someday to help kids and parents manage allowance, etc. You know I’d be all over that like white on rice. But for now, I think this could be a fun way of “learning while earning” Bitcoin as they manage their day and their responsibilities. My Job Chart is not currently a Bitcoin-friendly entity, however, I did contact them to let them know how I am using their site and if they were interested in looking into Bitcoin as a possible integrated feature. I hope I hear back from them! 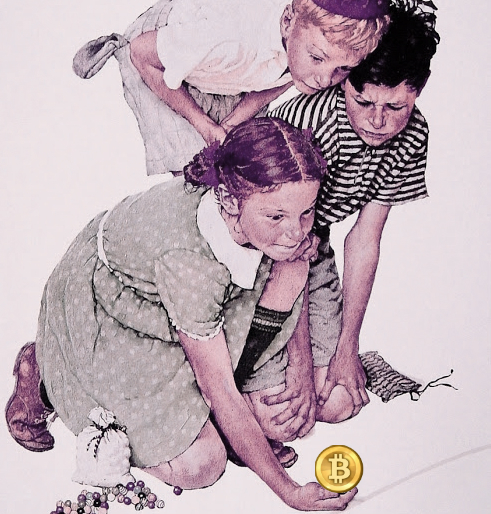 Why bother the kids with Bitcoin? I see it as an opportunity to teach them not only a new technology, but how the financial system works, what value means to them, and where Bitcoin can fit into that picture. They are already so immersed in the culture thanks to Mr. P and I, so hopefully this can take it to the next level of engaging them in what we do and why we are stoked about Bitcoin! What methods do you currently use in your family regarding chores and allowance? Do your Bitcoinette’s earn Bitcoin from you or do they receive allowance denominated in Bitcoin? Would you use an online chore chart app if it had a Bitcoin micro-reward system built into it? I’ve been paying my kid’s allowance in Bitcoin since 2010. We’ve always had issues with remembering chores and remembering to get paid. This app seems like it might make both of those problems easier to handle! Why not just give them scraps of nickle alloy they can return to you like slaves on a plantation? Your system is rather good, good for it to be incentivized. I may tell you that I can only do that system for a little while before I fail to keep it up…. so one of the ways I’ve been successful for the last month or so is that you take the chores and separate parts that are involved with dinner, cleaning, etc., and while using your list you let the kids themselves figure out who is going to do what. Let them decide. You supervise making the list, and when it’s time to begin the list. Focus on asking questions like “where are you ALL at in getting the list done for after dinner clean up?” There’ll be arguments, and you may referee, but do it asking questions if at all possible, no telling. It takes some practice, but it’s worked for our house. It’s made the kids more of a team, though there are arguments they have to work out what’s fair. Combined with bitcoin it may only get better! I’ll have to post on this after following some of your methods. Cheers.